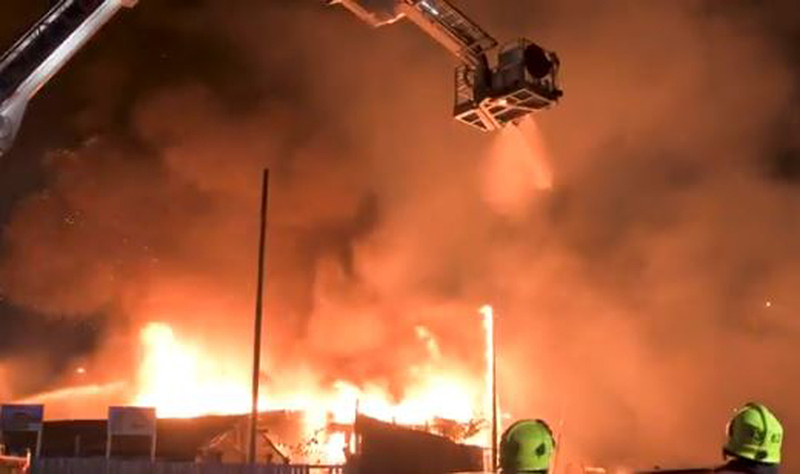 A blaze broke out in four buildings at Nottingham Cattle Market after gas cylinders exploded yesterday evening. The blaze was brought under control by the fire brigade. Image via: Nottingham Fire and Rescue Service. Auction house Arthur Johnson & Sons, which runs The Nottingham Auction Centre on Meadow Lane close to the fire, has not been affected and the blaze was stopped before it spread further. There are no reports of casualties and Nottingham Fire and Rescue Service announced the fire was under control late last night. It said an “investigation into the cause of the fire” has begun. The next sale at the auction house takes place on November 10. Near-by saleroom Tim Davidson Auctions is also trading as normal.